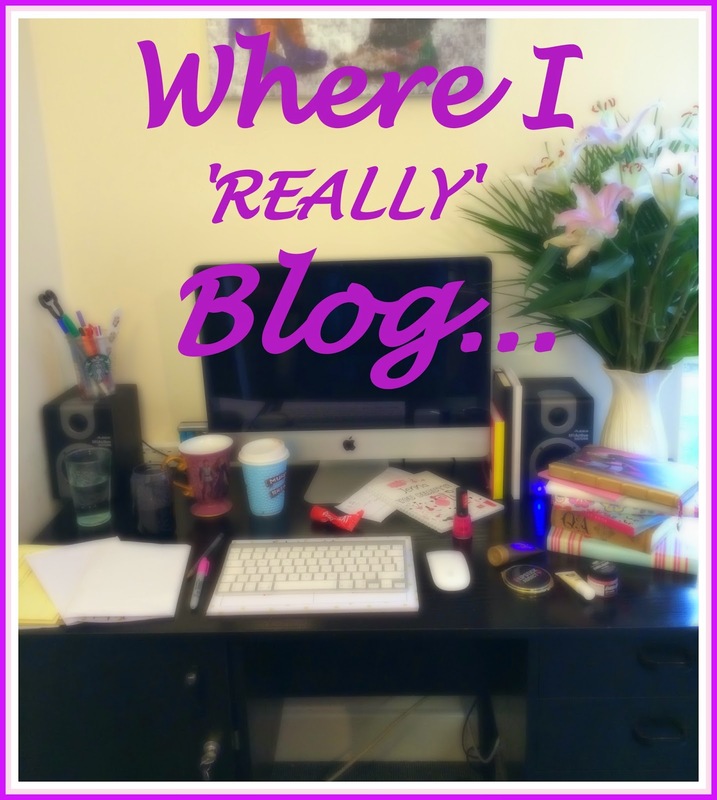 I'm always seeing posts that give you an insight in to a bloggers life, you can see where the posts are written and get a bit of behind the scenes action. I love all the pretty pictures and I always end up feeling envious of another blogger's set up and immediately find myself browsing Zara Home for a load of new house bits! But how real is it? 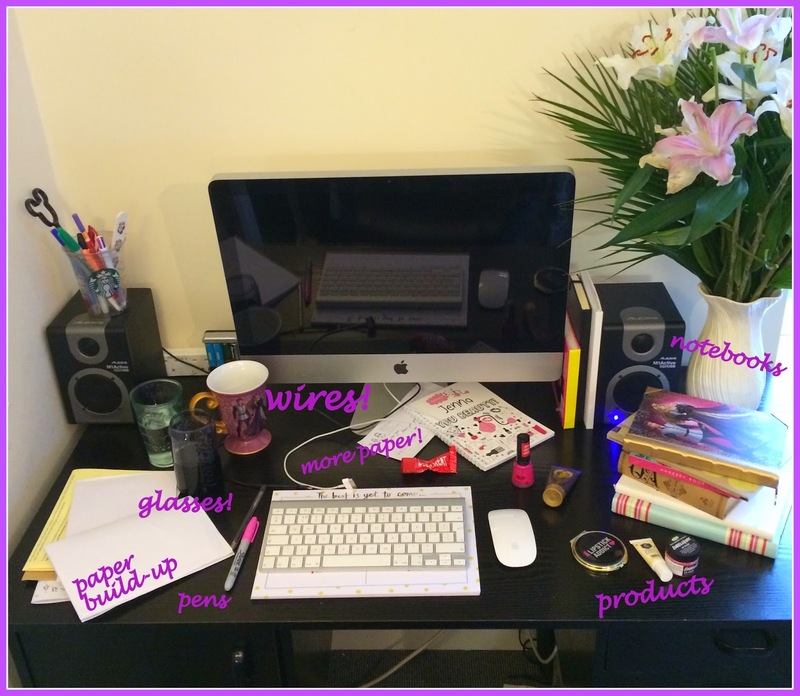 Oh perfect Beauty Blogger do you really live like this? If you do.. Bravo (yes, bravo). I planned on doing one of these posts myself and I kept putting it off, mainly down to the fact I couldn't be bothered to sort my desk out. I'm pretty tidy everywhere else but my desk is a constant mess. So why was I putting off doing the post because I needed to tidy up first? Surely that's not really the point? This is what I'd like my desk to be like, and after a clear up it honestly starts off like this! But it lasts about 5 minutes before it's a wreck again! You'll see my desk isn't the typical 'bloggers white' and it's in a pretty dark corner of the room. Firstly there's wires.. so many wires! Where are everyone else's wires? We all have chargers and what are your computers powered with? fairy dust?! I never finish a drink, and I seem to have at least 3 on my desk by the end of the day. I start off telling myself "Today is the day I'll drink loads of water" then a couple of hours later I get bored of it and get a Coke. Then I fancy a cup of tea. Pretty much every day ends with a warm glass half full (ever the optimist!) of water on the desk along with a couple of extra glasses too. There are more notebooks than I know what to do with which are mainly full of odd words that make no sense when I next look at them. The desk planner is there but that is only used for particular notes, some things don't make it to the desk pad! Oh no! That's where the random bits of paper come in! Lists upon lists scrawled on the back of (probably important) letters and press releases! The pen pot is soon forgotten about and pens just get chucked everywhere. "I don't need a biro -this To Do List calls for PINK SHARPIE!" One by one the beauty products make their way on to the desk, either to look to for information for blog posts or to use while I browse Twitter. This week a tube of Deep Heat made an appearance after an over zealous plank session! Who am I kidding?! Even the 'After' picture is an improvement on the mess of my desk. Right now there's an extra 2 pens, some unopened post, a 20% off WH Smith voucher, my iPad (plus charger -another wire! ), a lip scrub, a blue tooth speaker, a Christmas decoration, a mini microscope (no really! don't ask) a nail polish and used cotton wool pad. They say geniuses have the messiest handwriting -maybe this is kind-of the same thing...? Well that's what I'm telling myself! 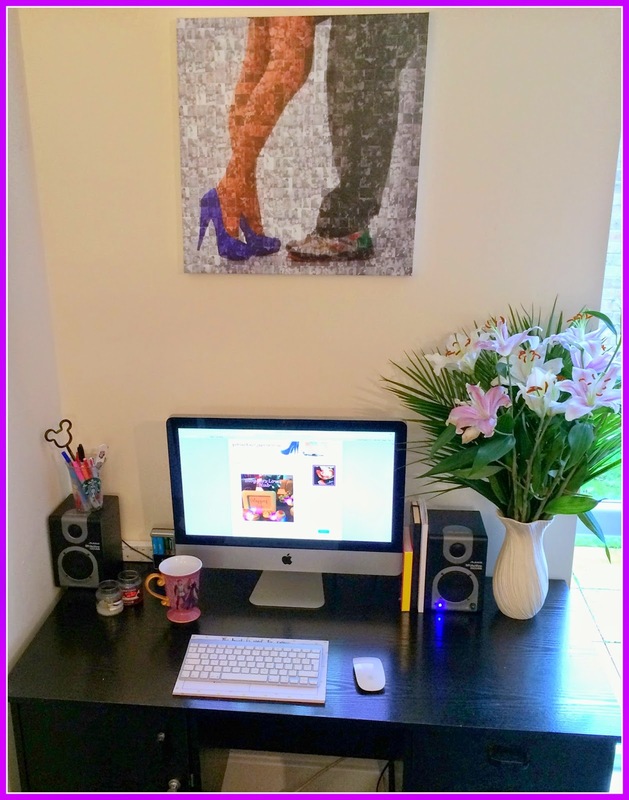 What is your blogging space really like?